Have you spotted Blue Banded bees buzzing around your garden or the small resin bees? We’ve had many visitors to our Air Bee and Bee hotels and the rocket flowers, borage and salvias have regular visitors. The Canberra Nature Map has been helpful for basic identification of native bees and Bee Aware of Your Native Bees facebook site also has several experts who are happy to help! The Beekeepers Association of ACT has had one of their busiest season catching swarms of honeybees from many people’s backyards and rehousing them in hives and also harvesting honey. Beekeepers Association of ACT annual Field Day Saturday 17th March 10-4pm, Dairy Flat Road, Jerrabomberra Wetlands. Lots of bee related activities if you’re interested in becoming a backyard beekeeper. ACT for Bees will be there so come over and have a chat with our group. We have begun the year with regular ‘Bee Friendly Gardens’ talks to a number of community groups who have contacted us. It’s been a great way to meet people and share ways of making our gardens a haven for bees and other pollinators and encourage biodiversity. 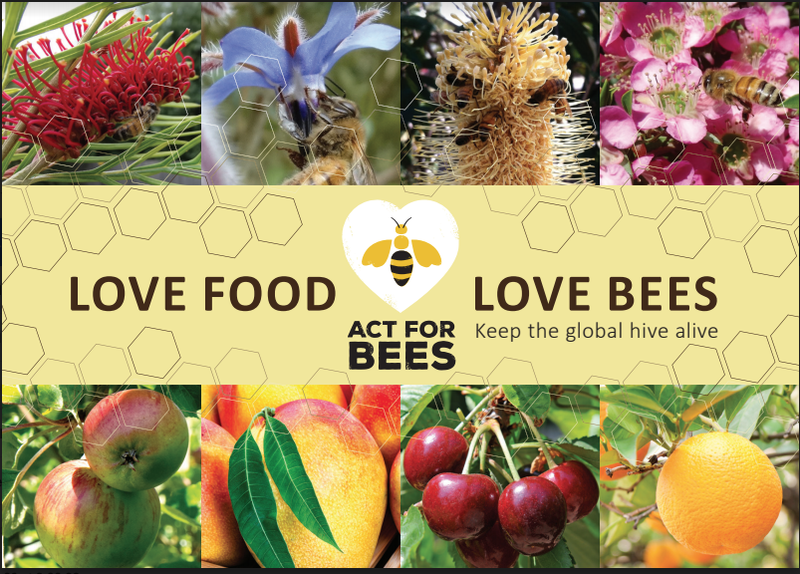 Please email us if you would like us to do a presentation(admin@actforbees.org). Have a look at Gardening for Bees and Bee Friendly Cities and Natural Pest Control sections of the website. I’ve left a couple of kale plants as decoys for cabbage butterflies to lay their eggs and regularly pick the leaves and compost them. 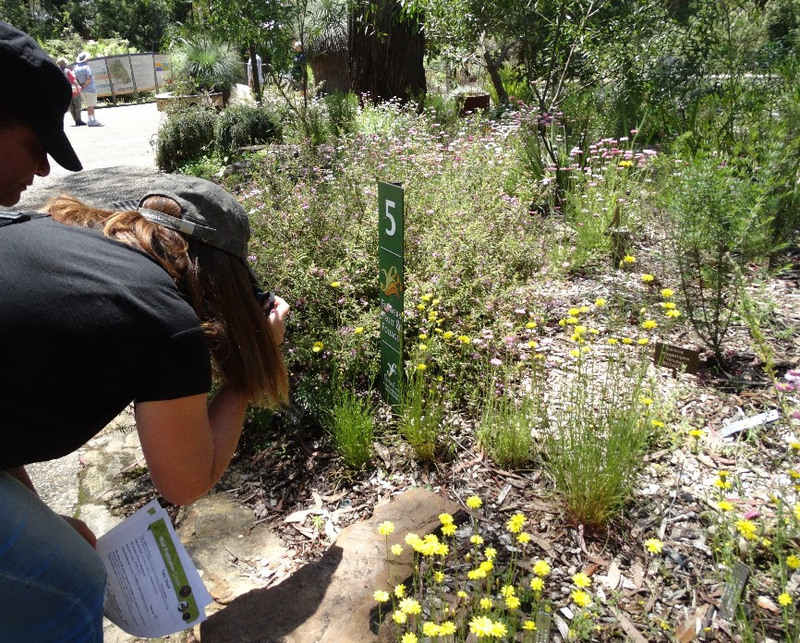 The Wild Pollinator Count for National Pollinator Week last November at the Australian National Botanic Gardens we spotted a variety of native bee species including Lasioglossum spp., Exoneura spp., Leioproctus spp. and Hylaeus spp plus a variety of wasps, beetles, spectacular butterflies, moths and quite amazing flies. According to the folks at the Wild Pollinator Count in November they had a record number of participants with 458 observations from over 126 locations around Australia. We hope that you will join in the next count in Autumn April 8-15 and contribute towards wild pollinator insect conservation in Australia. Last year a citizen science project in Germany, similar to the Wild Pollinator Count has been operating in 64 nature protected areas for the last 27 years, yielded concerning results: a 75 decline in total flying insects biomass. These results suggest there is a more serious general problem with pollinators elsewhere. It has flagged the importance of pollinators for the health of ecosystems and the economic impact of their declines on wild plant populations, crop production and human nutrition. Bees and other pollinators are essential for the pollination of 90% of the worlds flowering plants and if there is a serious decline, it has an effect on the whole ecosystem. Plant for pollinators! Great news for bees and wild pollinators in Australia with the welcome and very unexpected news of Bunnings announcing the removal of neonicotinoid pesticides from their shelves by the end of 2018 and replacing them with organic or herbal products. (These are still pesticides and harmful to bees if sprayed whilst bees are out foraging, but breakdown more easily). By the end of 2020 it will have phased out their use on plants. Woolworths, Mitre 10 and Coles stores have decided to stop the supply too. We are very interested to see if there is a change in laws and policies to do with pesticides in Australia following this move. We would like to congratulate and thank Westfarmers, specifically Bunnings, on your decision to cease sales of products containing neonicotinoid pesticides that are harmful to bee populations across Australia. We believe that this precautionary, but crucial decision, sets a standard of sustainability across Australia with Westfarmers pioneering the change in the corporate sphere. As you know, this will significantly reduce the use of neonicotinoids across its largest users, the backyard gardeners. This will make a significant positive impact on the future of Australia’s honeybee populations in a time of uncertainty and possible colony collapse. We expect it will also positively impact native bee populations that overseas studies have shown are also affected by these pesticides. The ceasing of neonicotinoid treatment of plants by the end of 2020 is an important move too. We hope that this is this first of many steps Westfarmers’ are taking towards sustaining Australia’s biodiversity. We look forward to the outcomes of this decision, future company directives, and shopping at Bunnings. Love Food? Love Bees!’ Year 5/6 curriculum has been downloaded by more than 1,000 teachers and adapted for use for a range of ages. Watch this space for our collaboration with Cool Australia to create a Year 9/10 Food Security curriculum aligned with the new Australian Geography syllabus due for publishing on Cool Australia’s website by the end of March 2018. The Weston Community Orchard, formerly part of Weston CIT Horticultural training orchard is humming with life and the trees are looking great. Since 2016 members of the community, including the Canberra Biodynamic Group and ACT for Bees have been hard at work restoring the orchard to a productive, diverse and rich habitat. Instead of pesticides, herbicides or fungicides, we have used a range of Biodynamic preparations to enhance the vitality and ecology of the soil and fruit trees. The first Working Bees for the year will be this Sunday Feb 18th 2018 10-3pm and are are held the 3rd Sunday of the month. Come and join in the fun, learn new skills and be part of an exciting community venture. Keep in touch through Facebook: Weston Community Orchard page. Hi, just to clarify, March 17th is a Saturday (not a Sunday as specified in the newsletter) . Is the event on Saturday the 17th? Hi Maria. Thanks for noticing. Saturday 17th March is the date for Beekeepers ACT Field Day. Hope you can come.